I know, who would believe it? 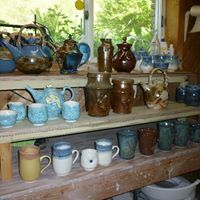 The Studio Moving Sale is on tomorrow (Saturday, May 19th, noon - 4:00 pm) … what a rush it has been to get everything ready! We’re down to the wire here. The move is in 2 and a half weeks. We are up to our asses in alligators (or moving boxes, don’t know which is scarier! ), and our moving sale which seemed far, far, away is tomorrow! 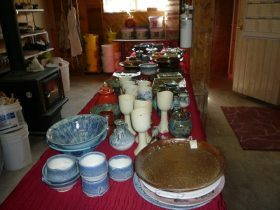 Or, just come on out and share a glass of wine, some marvelous Canadian cheese, and check out the pots. This is, without a doubt, the hardest move I’ve ever had to make. It’s not just that we’ve got sooooooo much stuff to pack, it’s the fact that we’ve made so many friends in this neck of the woods that it feels like we are leaving home. In fact, now that everything’s in bloom here we wonder what in heck got into us! But, that’s water under the bridge now … we have the new place in Tara already and this one is changing hands soon. I hope that the new owners will appreciate the place as much as we have! Anyway, I hope you’ll have a chance to come out, look at a few pots, share a glass of wine and perhaps a few hugs. I’m going to be creating a new studio space at the new location and any time you’re up at the Bruce I’d love to see you. All of the address changes and so on will be posted on the website once we’re actually moved. Come out tomorrow if you can. It will be great to see you. We’ve got a garage sale on Sunday too from 9:00 am to noon (just in case you’re into tools, not pots).